A common and disabling foot ailment which has a multitude of treatment options. Symptoms usually occur after rising from bed in the middle of the night, and or in the morning, but can occur after sitting down for just a few moments. Usually symptoms improve as the arch structures and calf muscle stretch to a normal functional position. This is why stretching is a hallmark of treatment. Body mass index, foot-type, shoe-wear and occupation may all be inciting factors. Diagnosis can be made during history taking and physical examination. X-rays should be taken to rule-out other inflammatory processes, and/or injuries. 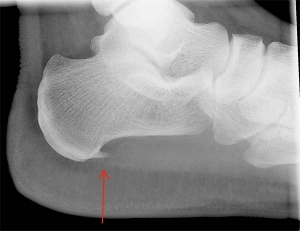 X-rays may show a heel spur (Heel Spur Syndrome) but, the spur has never been proven to be the actual cause of pain. A newer treatment utilizes sound-waves to create the formation of new blood vessels at the painful area, and has been shown to be very effective. it is important to note that there are low energy sound-wave devices, that have been shown to be less effective. Make sure the device being used is the higher energy type of device for maximal outcome. The treatment is an excellent alternative to surgical intervention. If you are experiencing the symptoms of Heel Spurs (Plantar Fasciitis), contact Medical & Surgical Foot and Ankle Care and the medical treatment center of Dr Keith Naftulin DPM. We address all issues associated with bone, tendon, muscle, joints, cuticle and skin. You may also schedule an appointment with the doctor’s office on-line.